It’s time to make up for never going to summer camp as a kid. Last November, I took on the National Novel Writing Month (NaNoWriMo) challenge, making the commitment to write 50,000 words in one month. It was a little bit stressful, very time-consuming, and easily the biggest writing challenge I’ve ever faced. This year, the good people behind NaNoWriMo gave writers the option of trying the month-long writing challenge again, this time in April. 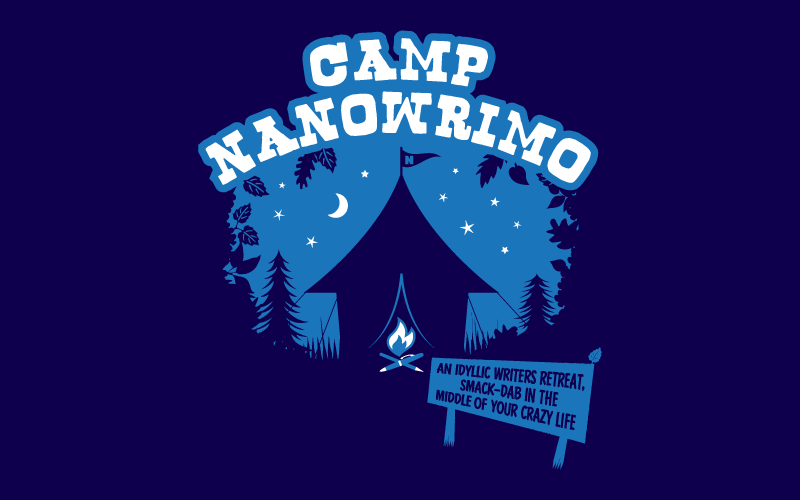 They’re calling it Camp NaNoWriMo. So…here I go again. Call me a masochist, but I’m going to try to write another book, this time during my last quarter of graduate school, which means I’ll be balancing this project with work, classes, finishing my graduate portfolio, and writing my final paper. No big deal. Actually, I’m not that concerned. If I don’t finish it, I don’t finish it. It meant a lot to me to finish the first time I tried, but, more than anything, trying again in April is about finding new ways to stay motivated. It’s like when the new year starts and you make a bunch of resolutions to get into shape. Then a few months go by and you go to the gym less, start eating more junk food. You need something to whip you back into shape. I like to think of NaNoWriMo as my own personal bootcamp. Writing every day last November helped me regulate my writing schedule. I figured out how much time I needed each day to write 2,000 words (generally two hours), tested out which times of day worked best for me, and became so used to my pattern of writing every day that since then, I’ve written something (part of a short story, a blog post, an article) nearly every day. At the very least, I’ve knocked out a few sentences or edited a draft. It’s a great feeling when you can look back on so many finished projects, but now I need to look forward to the next big one. This time, I’m going way into left field and writing a young adult novel. Not only that, I’m trying my hands at the mystery genre. For anyone who knows my writing, I’m a realist, character-driven story writer. I’d rather spend pages inside my character’s head than working on a fast-paced plot. So what better way to challenge yourself than to try something completely different. If anything, I think I’ll have a lot of fun with this book, and that fun will hopefully be the motivation I need to survive another round of NaNoWriMo. When I tried NaNoWriMo for the first time, I decided I was going to do it at least four months in advance. That gave me plenty of time to think about everything from plot to characters to setting, and to write extensive notes and an outline. I decided on round two only a month or so back. I’ve got a summary, the start of an outline, and a few rough character sketches–not exactly the best preparation, at least compared to last time. My first NaNoWriMo book was also deeply personal to me, exploring themes that are relevant to my life now and with a setting in my hometown. This new project is about a private school (I was a public school kid), playing on the roller derby team (I admire it, but have never played), and solving the mystery of a dead teenager. This territory is new and a bit scary. I’m keeping my expectations low and focusing on having fun. The excitement I feel over trying my hands at young adult mystery means more to me than saying I wrote 50,000 words in one month. But that would be a nice cherry on top. Have fun, and I can’t wait to read the story someday.